This dish takes a little longer to make, but that's only because it needs to simmer for an hour. The actual cooking part only takes 15 minutes. 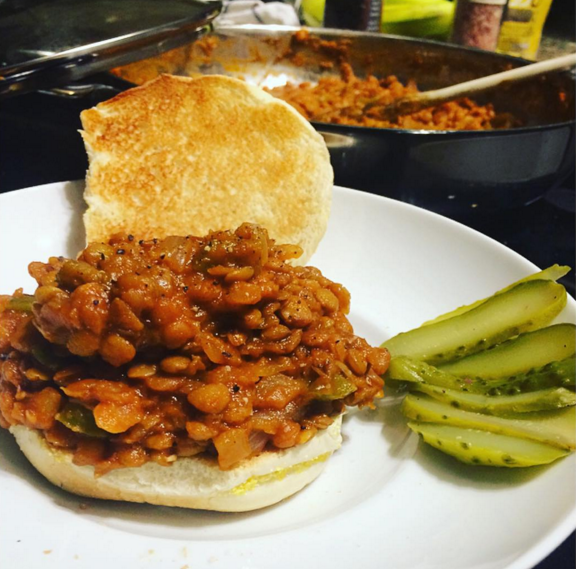 It's originally a recipe for Lentil Sloppy Joes, but I also eat it as a stew with some toast on the side. I very often make a double batch of this and eat it for days in a row. It's seriously so filling, high-carb/low-fat, and most importantly...DELICIOUS!!! *** I also add a jalapeño or two, as this dish is very mild even with the chilli powder. *** The first time I made this I misread the ingredients and made it with white-wine vinegar, instead of rice vinegar - that's how I make it to this day, and it tastes great. *** The grocery store by my house only carries dried green lentils, so that's what I use! Place 1/3 cup of the water in a large pot. Add the onions and bell pepper and cook, stirring occasionally until onions soften slightly, about 5 minutes. Add the chilli powder and mix in well. Add the remaining water, the lentils, tomatoes, and the rest of the seasonings. Mix well, bring to a boil, reduce heat, cover and cook over low heat for 55 minutes, stirring occasionally. Serve on whole wheat buns. Let it simmer for longer if you want it even thicker!